Temple 6, Anraku-ji (安楽寺), is approximately 16.5 kilometres from Temple 1, Ryōzen-ji (霊山寺), and is where many people stay for their first night when embarking on the Shikoku pilgrimage. In fact, 100 foreigners from about twenty countries spent a night here in 2013 and 2014. The temple has eighty rooms, which can accommodate up to 350 people, and the price for one night’s stay including dinner and breakfast is 7200yen. A long time ago hot spring water (onsen) was discovered in the vicinity of Anraku-ji, which proved effective for curing illnesses. As a result, people came from all over to pray here and be healed. In 815 Kōbō Daishi visited this spot during his pilgrimage around Shikoku, carved a 40cm high statue of Yakushi Nyorai (薬師如来) – the deity of healing, enshrined it in a sanctuary, and named this place Onsen-zan, Anraku-ji (温泉山安楽寺). This temple prospered to such a degree that it is said there were twelve buildings on the grounds and the bell was always heard due to the never-ending number of visitors. 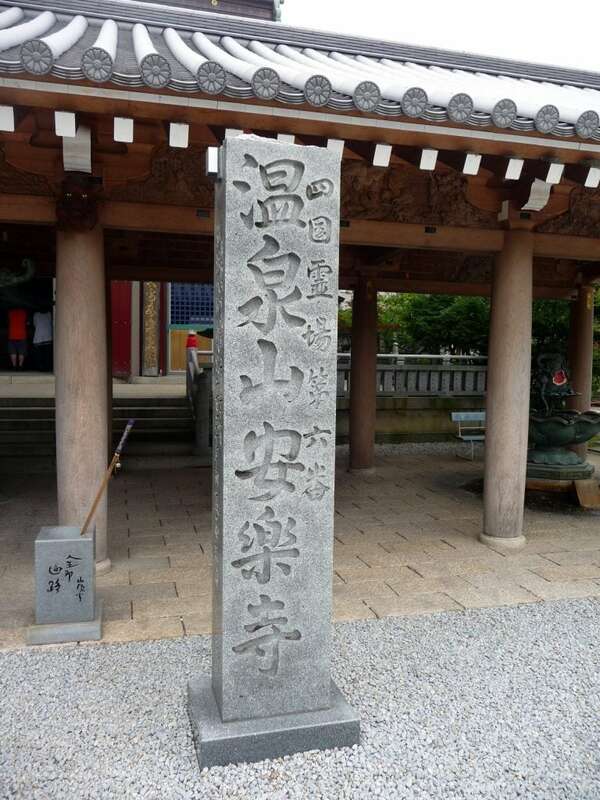 However, during the 16th century, it was completely destroyed by fire by the troops of Chōsokabe Motochika (長宗我部元親:1539-1599), a daimyo of present-day Kochi prefecture who controlled all of Shikoku until 1585. During the Tensho period (1573-1592) Anraku-ji was rebuilt about two kilometres away from the original site. In 1598 it was given another name of Zuiun-ji (瑞雲寺) when the lord of the Tokushima domain Hachisuka Iemasa (蜂須賀家正:1558-1638) decreed that this temple along with seven others be chosen as ekiroji (駅路寺: road station temple) along the five routes coming into Tokushima. It is said that ekiroji were “to maintain strict control over public peace and military affairs” and “it was possible for paid spies to watch the activities of both travellers and nearby residents.” (Mayumi Banzai, 1973) After this event few details can be found in the temple’s history until the main hall burned down in 1955 and a new one was completed in 1966, however, in 1962 someone, who was cured of spinal tuberculosis, presented the temple with a large statue of Yakushi Nyorai in which the small original statue was placed inside. There is a lot to see on the temple grounds, but one thing not to miss is the so-called upside-down pine tree. When Kōbō Daishi was praying by a pine tree a hunter, who wanted to feed the liver of a wild boar to his sick father, mistook Kōbō Daishi for wildlife and shot an arrow toward him. However, even though there was not any wind the branch of the pine tree moved to protect Kōbō Daishi and was pierced by the arrow. When Kōbō Daishi heard the story from the apologetic hunter, he said, “I will pray for your father, but repent of any selfish thoughts and have a heart of support and be willing to offer help to people and the world.” The next morning at home the hunter saw in amazement that his father was able to stand. Kōbō Daishi made the hunter plant the branch of the tree upside down and said, “If this branch takes root and grows, people who come here in the future will be protected from any misfortune.” The branch has grown into a large tree that is called “Yakuyoke no sakamatsu” (厄除けの坂松: the upside-down tree that prevents misfortune). 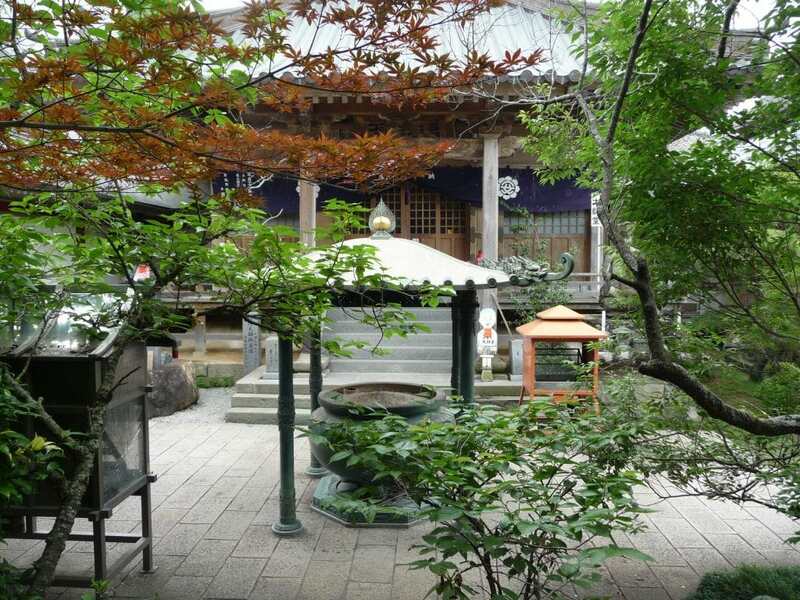 A tale was recently rediscovered about a pilgrim from the 19th century: There is a tea house in front of the gate of Anraku-ji and the owner`s name is Kazō. During the summer of 1810, a pilgrim from Wakayama prefecture came to stay the night at the tea house, but in the morning, his summer kimono had disappeared. The lodging owner and many others searched for it, but it could not be found. In his heart, the pilgrim suspected the lodging owner but left the tea house to continue the pilgrimage. Eventually, the pilgrim finished his journey and arrived at a place to stay in Okasaki, Muya of Tokushima prefecture (Naruto-city). He was very happy to have been able to leave his osamefuda (name-slip) at all of the temples. When he talked about his missing kimono, one pilgrim came to the front gate and asked about boats going to Awaji Island. The woman of the inn saw this man and thought “This is the kimono which the other pilgrim is looking for. There is no doubt about it.” She very nonchalantly welcomed the man in and asked about the kimono. He slowly blushed and confessed to his crime. Isn’t it strange how he just happened to come to this inn and when asked why he came, the pilgrim who committed the crime said, “On the outskirts of town a priest said to me, `If you want to ask about boats to Awaji, I will tell you what inn to go to.` He gave me a fuda. Please look at this.” When they had a look they realized that it belonged to the inn owner that the pilgrim had stayed at back in the spring. The pilgrim from Wakayama believed that it was Kōbō Daishi who provided that fuda. 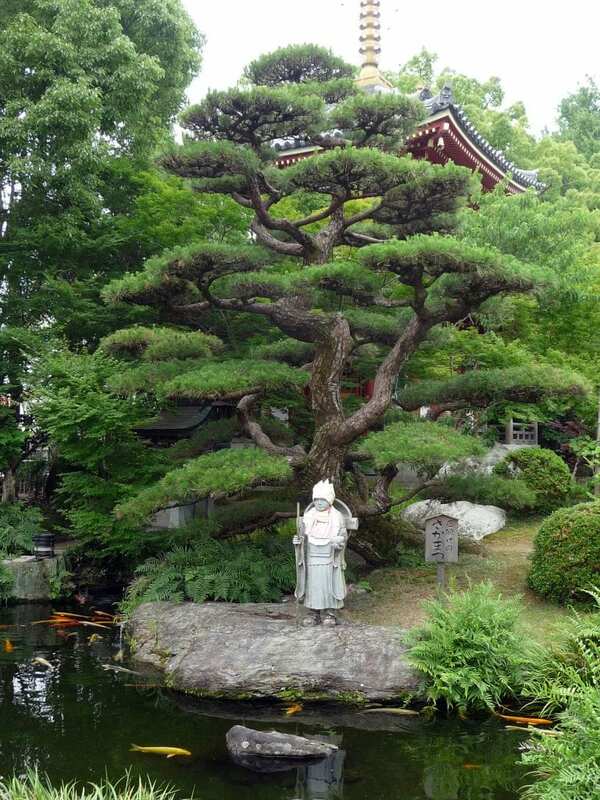 He shed tears of gratitude and realized that suspecting the tea house owner in front of Anraku-ji was the wrong thing to do, so he quickly sent someone to the house of Kazō who told him about what had happened and apologized on behalf of the pilgrim. This article was first published in the August 2015 issue of Awa Life.